These two toy figures of bulls, crude as they are in comparison to the animals depicted on some of the seals, already show some of the plastic sense as well as the sympathy for animals which have always characterized the Indian modeller and sculptor. 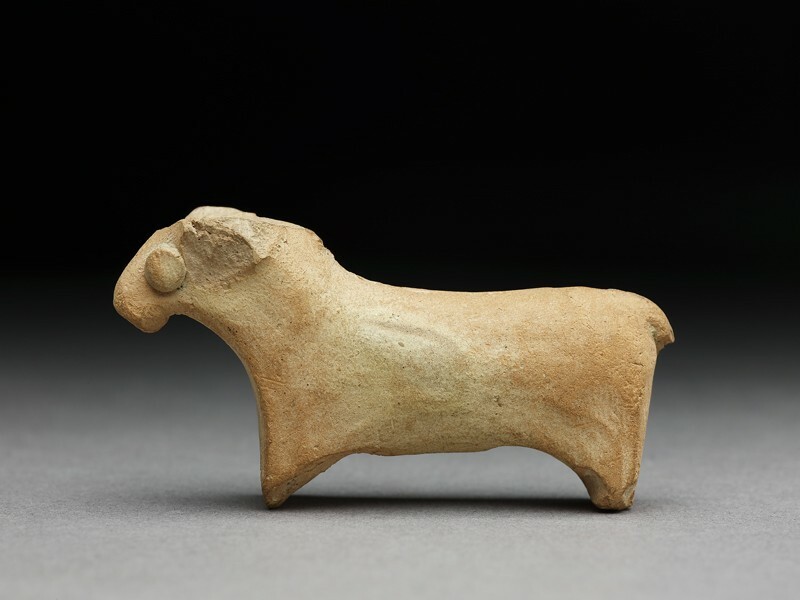 Although straight backed cattle were already known in Harappan times, these appear to have been modelled on the typical Indian breed (bos indicus) with its hump, only traces of which remain, however, on these little animals. The larger (left) has a neatly drilled hole through its neck. It was probably one of a pair, and the hole allowed one of the small terracotta bullock carts, many of which have been found at Harappan sites, to be attached; it also suggests that the modeller had oxen in mind. The set of horns on both animals supports this. The smaller (right) has pellet eyes. Chanhu-daro is an important Harappan site some 75 miles (120 km.) south of Mohenjodaro. According to the excavator, bulls with drilled holes for attaching little carts are not found at the latter site while the front and rear legs joined together, as in the pair illustrated, are only found there at the earlier levels.